Easy to install junction box provides convenient wiring connection for use with one single phase pump in effl uent and sewage chambers. This junction box provides a convenient location to connect all wiring required for a typical pumping station installation. The junction box employs a receptacle to accept a 120 VAC or 230 VAC piggy-back plug and a pump plug. The JB Plugger also features an easy-to-use terminal strip which can be used for connecting an alarm system in the junction box. 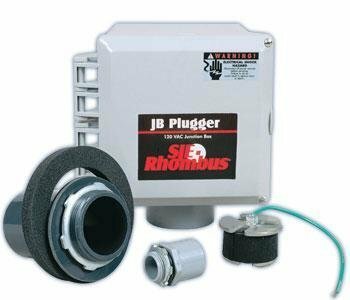 The JB Plugger package ensures a liquid-tight seal and strain relief for the cable entering the junction box from the pumping station.